It was cold this morning. Really cold. I bundled up as best I could with the warm-weather clothes I’m traveling with. 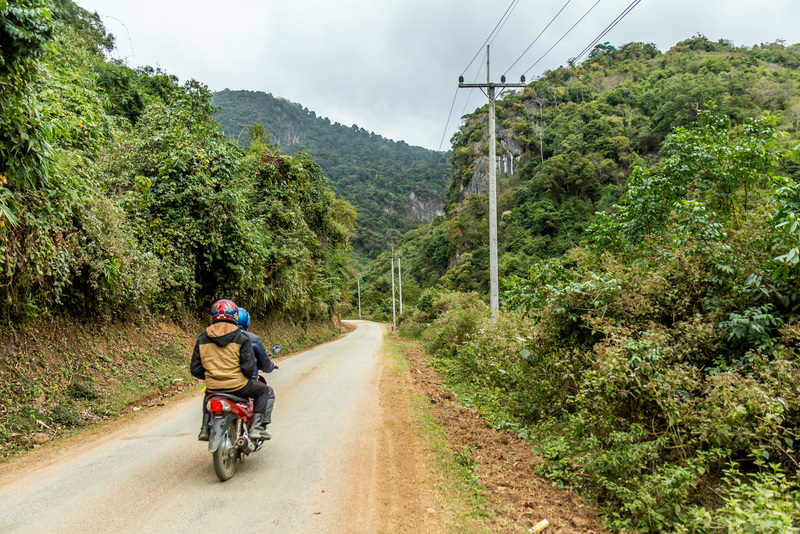 I got on the road at 8, and rode out of the grim town of Quan Son. It was drizzly again, and the sky was gray. The road beyond town deteriorated. There were some really bumpy stretches. Then there would be a nice new stretch. Then it would turn to dirt and mud. Then nice again. Then gravel. There is a lot of road work being done, but it seems like it’s being done in a haphazard fashion. By the time they finish a stretch and move on, the nice stretches are probably already deteriorating. 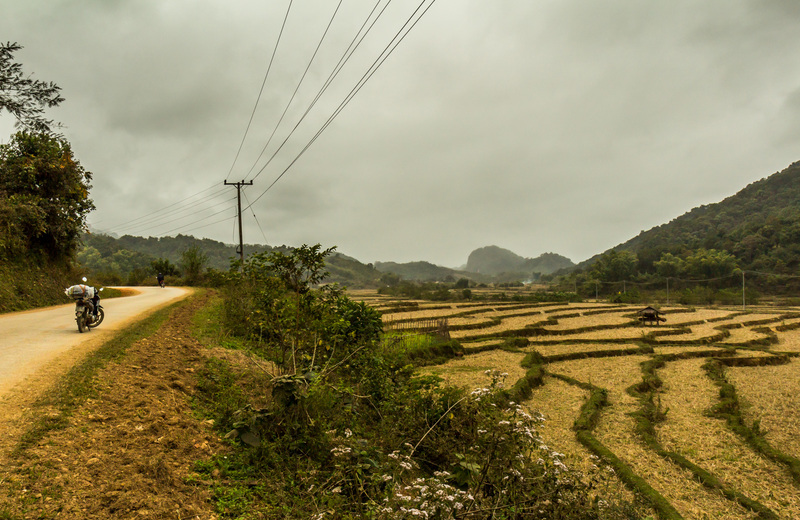 There’s not much truck traffic to and from Laos, so I’m not sure if they are trying to turn this into a pan-Asian superhighway, or just trying to maintain the terrible road. 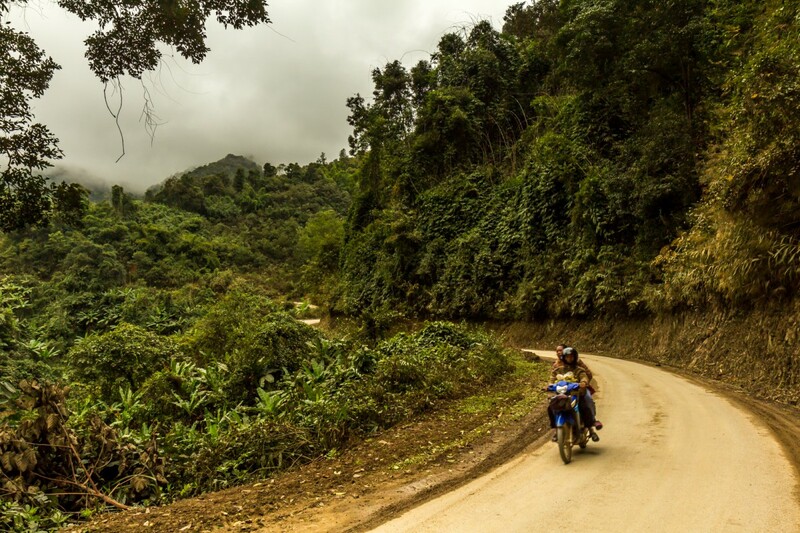 Going to the Vietnamese border post. I went up into the mountains and it got colder. The tradeoff was that there were some good views. The houses were wood, not concrete here. 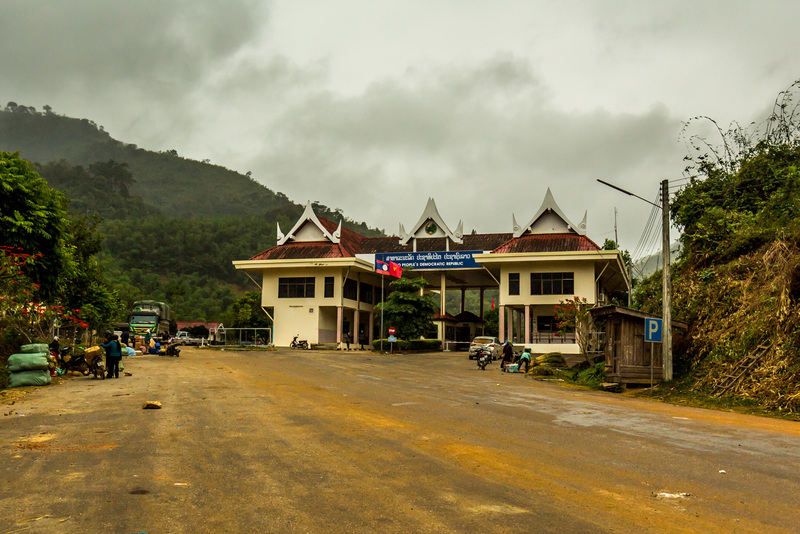 I rode on until the rough little frontier town of Na Meo, which Google Maps incorrectly showed as being deep inside Laos, leading me to a brief moment of panic that I had somehow missed the border and snuck in. The town had a bustling market, but I rode to the border station. At the border the serious, impressively uniformed Vietnamese guard took his time stamping me out. He wanted to see my motorbike’s ownership blue card. He took it and put it under a book, then acted like he forgot about it. Since I would have to show the card again, was he trying to steal my bike? 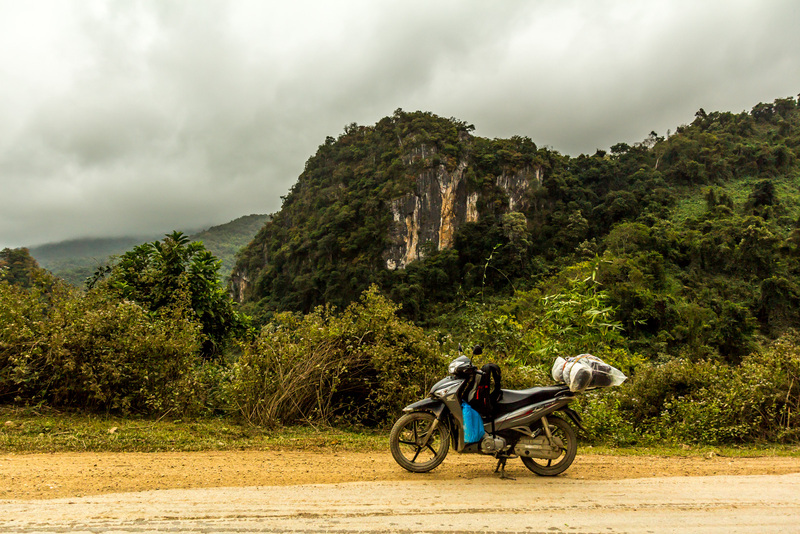 Unlike crossing from Vietnam to Cambodia, I had to go through customs, where I had to pay 200,000 VND for a form for my bike and show the blue card. Then I could ride through. On the Laos side the un-uniformed officials took their time stamping me in. I shivered in the cold as I waited and worried. I already had my Laos visa, so there should not be a problem. Eventually they returned my passport and waved me on. I had to go through their customs, show the Vietnamese form, and pay $3. Then I was free to enter Laos. After walking my bike through the border post as instructed there was no traffic. There were amazing views of huge limestone cliffs. Patchworks of little fields looked like they grow corn, but they were all fallow. Herds of cows grazed in them. There were hardly any people. The empty fields were a contrast to the fields across the border in Vietnam, which were always full of workers. 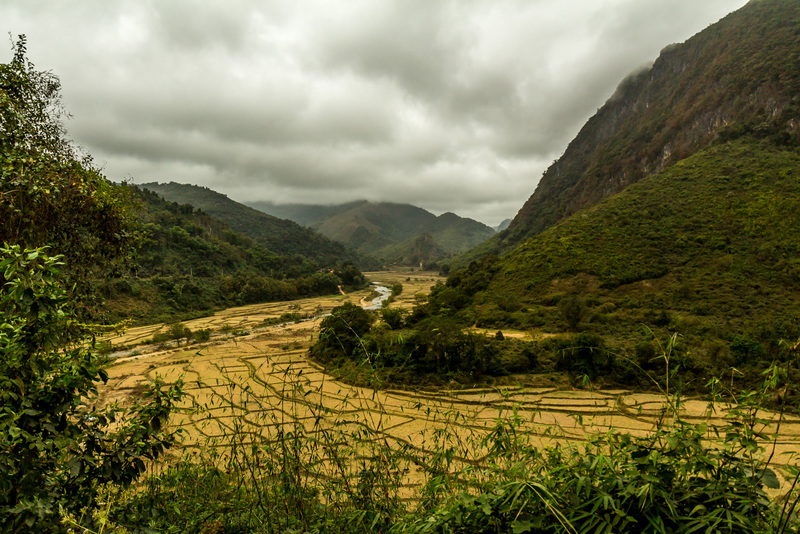 Another contrast was that the landscape was more rural, with none of the industrial detritus you see everywhere in Vietnam. I rode through tiny villages of rustic wooden houses. Kids said hello. A lot of people seemed surprised to see me. The scenery was fantastic, but I was so cold and wet I didn’t really enjoy it. I had lunch at the Indian place. The guy is from India and speaks perfect English. He sold me a Lao SIM card, and gave me information on the caves. After eating I rode to the cave visitor center. I learned a little about the town. It was the capital of the territory the Pathet Lao communists controlled during the revolution. The caves were were all the people were forced to live during America’s secret nine year bombing campaign. 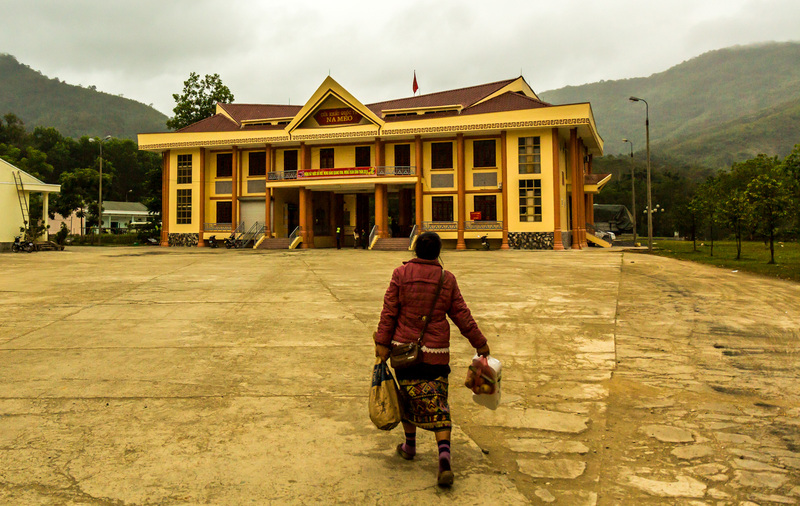 In the end, one of the poorest countries in the world prevailed over the most powerful one, so they named the city Vieng Xai, meaning Victory City. There’s really nowhere else to go here, so after that I went back to my basic room to lay under my blankes and try to get warm. It will get down to freezing tonight, and the next few nights. That’s as cold as it gets here, and I am here for it! I had dinner of laap moo and khao niao at the Indian place. He had a fire, which was nice. Then back to my freezing room. The landscape was stark yet beautiful. 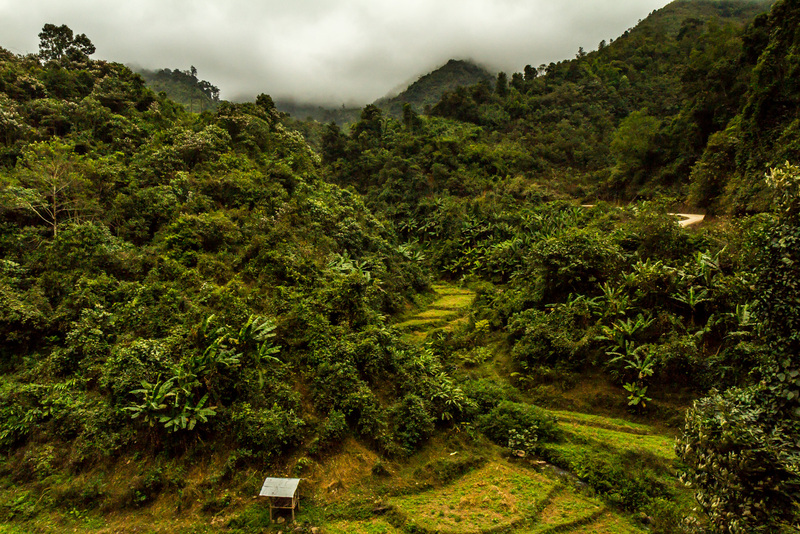 The green hills were covered with thick vegetation. 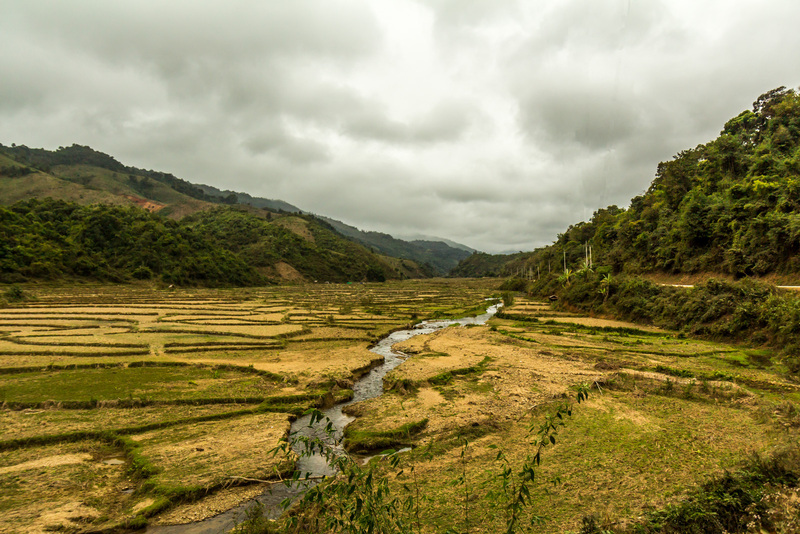 Despite being so close to Vietnam, the landscape was different.